Below - See how you can add this photo and link to our Holiday Calendar from YOUR blog or Website!! 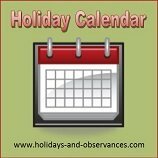 Below you will find our Holiday Calendar that will list all the Daily Holidays and Observances and Awareness Days. Below that, you will find our Weekly Holidays Calendar that highlights the observances that span multiple dates. We will not be adding the Monthly Holidays and Observances to this calendar, as it would be pretty repetitive since they are celebrated on each day of a certain month. You can find them all listed out on our Holidays By Month pages. For Holidays and Observances that are celebrated on the SAME Days each year, we have these set to repeat each year on the calendar. 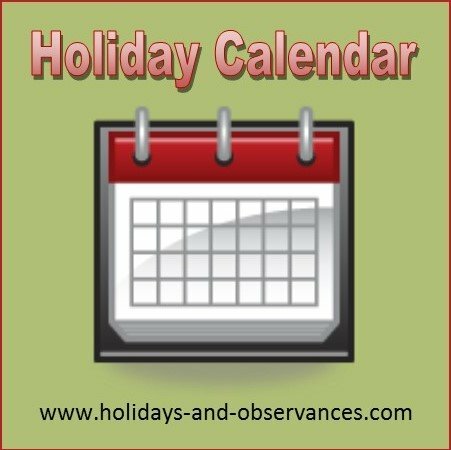 For Holidays and Observances that are Movable Dates where the date changes each year like Thanksgiving, we update the dates annually. There are several different views to look at the Calendar at the top right hand corner of the calendars - Weekly, Monthly, and Agenda is a written listing by day. Here is our Holiday Calendar that has just the Weekly Holidays, Observances, and Awareness Weeks. Add Our Holiday Calendar to YOUR Blog or Website! STEP 1: Right Click on Whichever Photo size that you want and chose the "Save Image As..." option. STEP 2: Copy the HTML Code below and place under where ever you have placed our Holiday Calendar Photo on your blog or website. The code will link to our Holiday Calendar Page (this page), in a NEW BROWSER leaving Your site open.